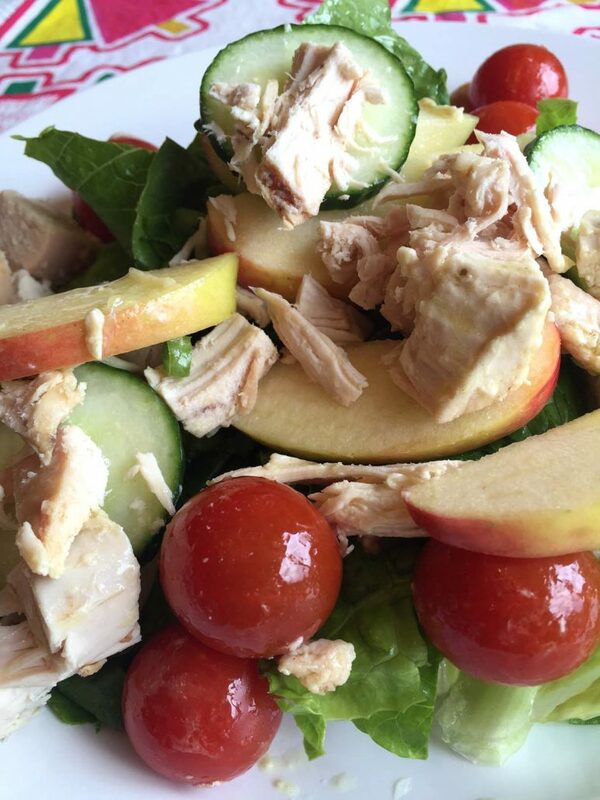 This amazingly delicious chicken apple salad will tickle your taste buds! 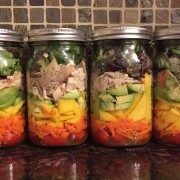 Colorful powerhouse of nutrition packed in layers in a mason jar! Make it in just 15 minutes for a week’s worth of healthy lunches! 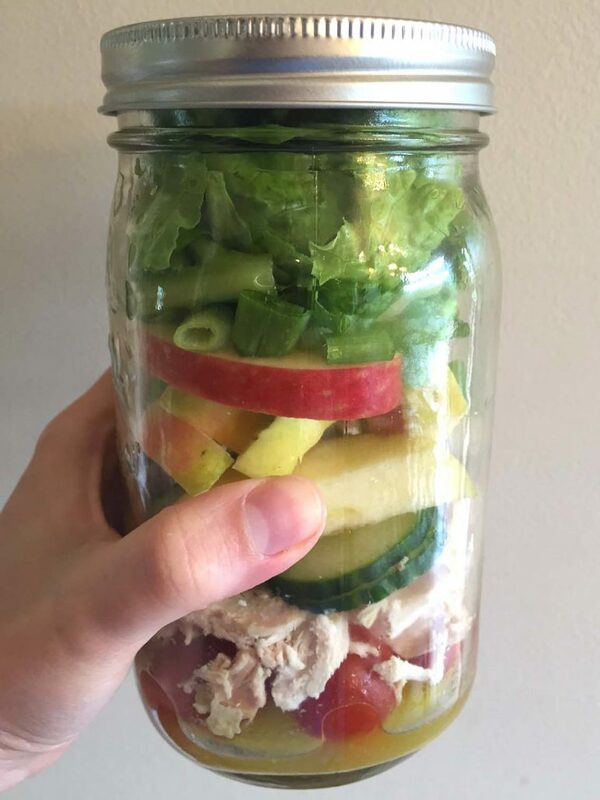 If you are looking to eat more healthy lunches, but it’s just hasn’t been happening, I’ve got 2 words for you: mason jars. Mason jar salads will totally transform the way you eat lunch, in a good way. 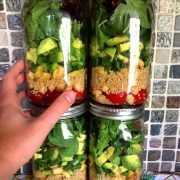 You can make the whole week’s worth of healthy lunches in less than 30 minutes, and the mason jars will keep them fresh! 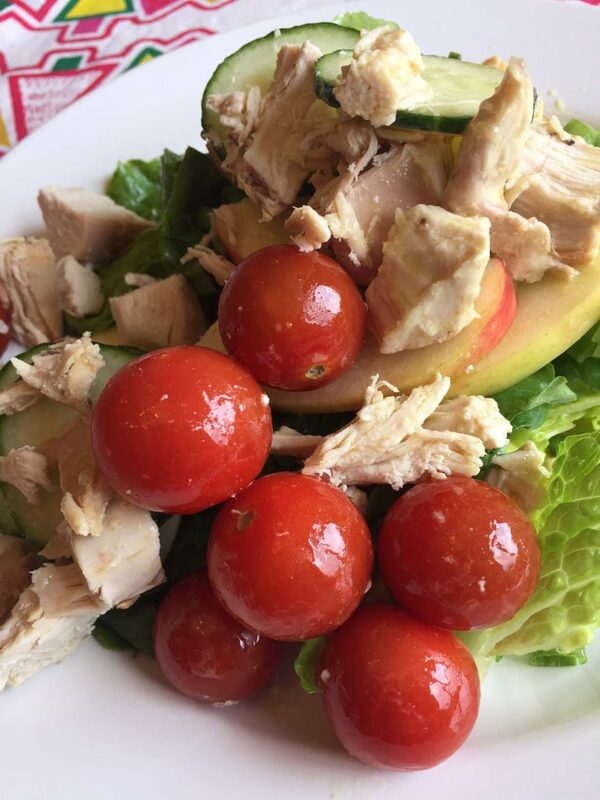 This chicken apple mason jar salad is like a nutritional powerhouse – it has chicken breast, apple slices, cherry tomatoes, cucumbers, green onions and lettuce leaves – super healthy! This healthy deliciousness is dressed with a homemade dressing made with extra-virgin olive oil, Dijon mustard and freshly squeezed lemon juice – yum! This dressing goes so well with this salad, you’ll love it! 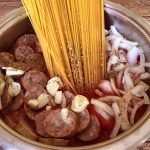 As with all mason jar salads, the clever layers keep everything fresh for up to 5 days! Dressing goes on the bottom and doesn’t touch the lettuce, so the lettuce stays super crisp! The layers look so good too – eating healthy is really easy when you have this beautiful colorful deliciousness in your fridge! Mason jar salads are super portable – just grab a jar and put it in your lunchbox, so convenient! Grab-and-go meals are such life savers for all of us busy folks! 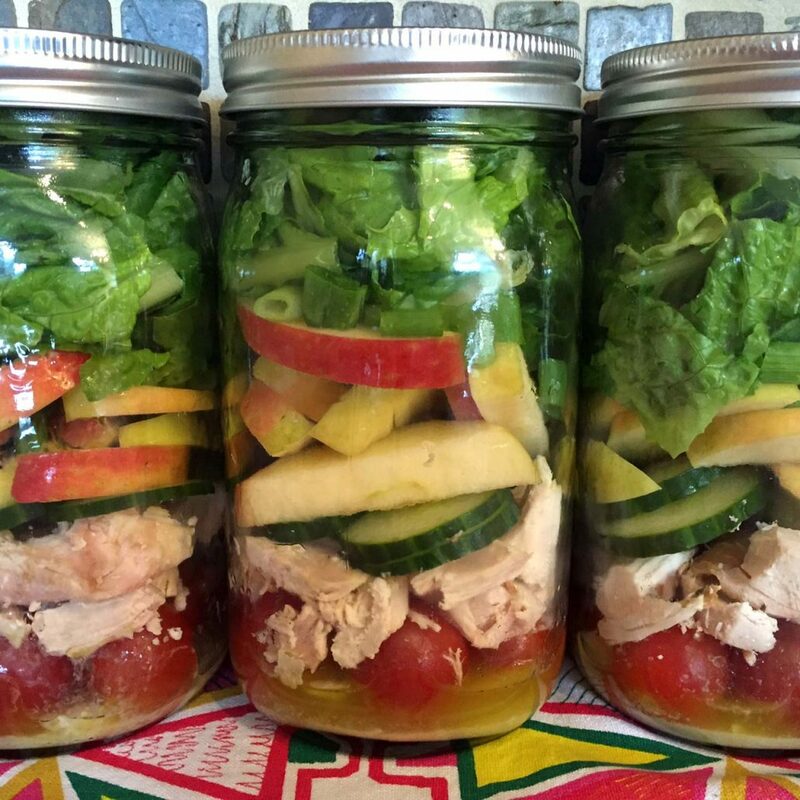 Enjoy these delicious mason jar salads! 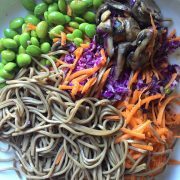 What a great way to have a healthy and yummy lunch! 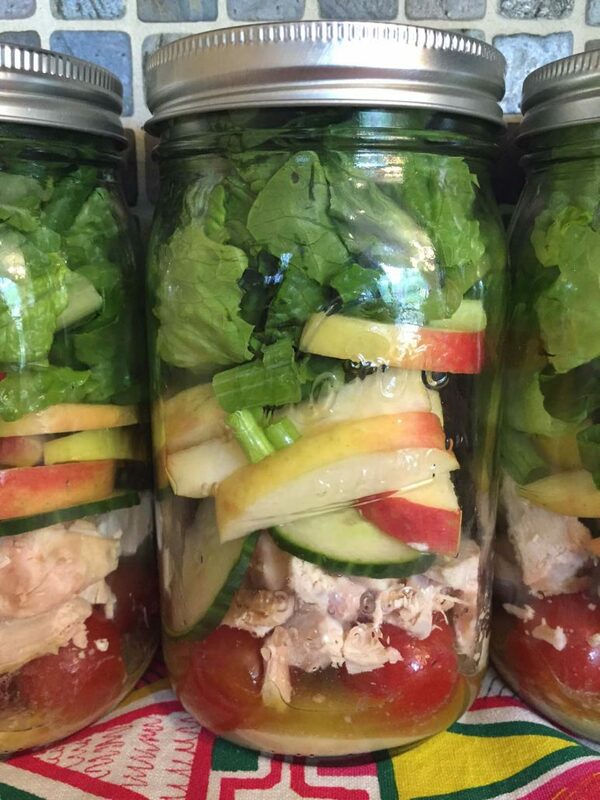 This amazing chicken apple mason jar salad is so delicious and so good for you! 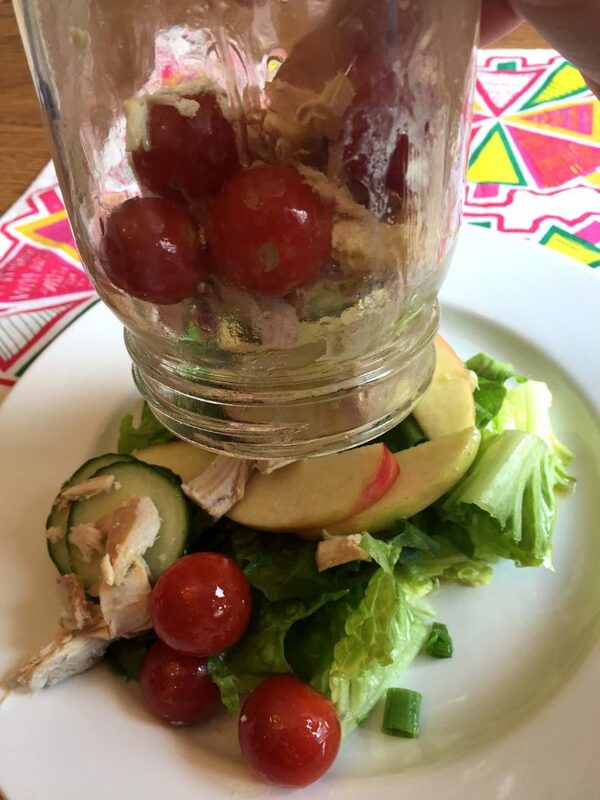 Chicken, apple slices, cherry tomatoes, cucumbers, green onion and lettuce leaves are layered beautifully in a glass mason jar, and flavored with the homemade lemon-Dijon dressing! Put apple slices in a bowl. Cut ¼ of the lemon and squeeze over the apple slices, and toss to coat. Lemon juice will prevent apple slices from browning. Make a dressing: In a cup, add olive oil, Dijon mustard and salt. Squeeze the remaining ¾ of the lemon into that cup. Whisk oil, mustard and lemon juice with a fork until combined. Pour the dressing on the bottom of 4 mason jars. Next, layers the ingredients into the mason jars in the following order: cherry tomatoes, chicken, cucumber slices, apple slices, green onion and lettuce. Close the mason jars and keep in a refrigerator for up to 5 days. To serve the mason jar salad, invert it onto a plate. 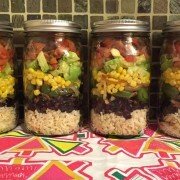 Mexican Vegan Burrito Bowl Mason Jar Salad (Chipotle-Style)! 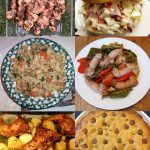 FREE Weekly Meal Plan (Week 31) – What’s For Dinner!